Results from yesterday’s Zurich Diamond League meet showed the poles pulling apart as some rode the high of the 2013 Moscow World Championships, while others looked like the long season had caught up with them. Eunice Sum, Nick Symmonds, Bohdan Bondarenko and Meseret Defar fell into the first category. Asbel Kiprop, Ezekiel Kemboi, Mathew Centrowitz, Ivan Ukhov and even Usain Bolt found themselves joined in the second. The most anticipated race of the evening was the 5000 meter showdown between former Ethiopian teen queens turned Olympic icons, Tirunesh Dibaba and Meseret Defar, the two most decorated women distance runners of their generation. Both arrived in Zurich as World Champions, Tiru at 10,000 meters, Mezzy in the 5000. Since they first squared off at the 2002 Carlsbad 5000 as precocious teens (Tiru took 2nd in 15:19 to Mezzy’s 11th in 15:58) theirs has been the match up that has most intrigued yet frustrated running fans. Though they have competed more than 20 times over the years, Zurich was only their third head-to-head clash since 2009. In this first duel of the year Defar proved to be two-seconds sharper, 14:32.84 to 14:34.82. 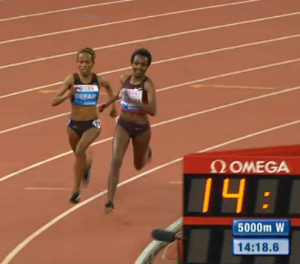 Her 58-second last lap – that held more in reserve as I saw it — forced Tirunesh to lead out from 600 meters hoping to use her 10,000 meter strength to grind down Meseret’s 5000 meter closing speed. Tiru’s sister Genzebe even aided the family cause by pushing the pace past 4K in an attempt to set up her older sis. But a cursory look at their seasons shows how Mezzy and Tiru have fashioned their focus in these times of race specialization, a focus that made Mezzy the favorite in Zurich. Though Tiru came into Switzerland as the 5000 meter world record holder (14:11.15, Oslo 2008) and the world leader in 2013 (14:23.68, Paris July 6th), she couldn’t dispose of Mezzy (#2 all-time,14:12.88, Stockholm `08) over the final 600 meters, though she tried mightily. In Defar’s favor was her focus on shorter distance racing throughout the season. Though she had shown ample strength with a 10,000 win in Sweden June 27th (in a world leading 30:08) most of her attention has been paid to the 5000. In that regard she tuned up for Zurich last week with a 3000m win at the DN Galan meet in Stockholm after racing 5000 meters in Shanghai (May 18) and Oslo (June 13). She then toured the distance twice more in Moscow at the World Championships earlier this month, once in the prelims then again winning the final (August 14 & 17). And while Tirunesh had raced over 5000m at the Prefontaine Classic June 1st, then in Paris on July 6th, her focus on the 10,000 in Moscow left her speed just a hair shy when compared to her great rival in Zurich, especially in a race that dawdled (by their very high standards) through the first 4K (11:52.15). We shall see if the tables turn when the two meet up again September 15th at the Bupa Great North Run in Newcastle, England where Tiru should have the upper hand as the defending champion (1:07:35), though Meseret PR’d in February at the Rock `n`Roll Half Marathon in New Orleans (1:07:25). Next up, however, will be a 10k world record attempt by Dibaba at the Tilburg 10K in the Netherlands this Sunday September 1st, which should set her up quite well for Newcastle. For a complete preview, go to my colleague Alberto Stretti’s fine blog. In any case, this is exactly the kind of back and forth rivalry that the sport is crying out for. Meseret currently leads their head-to-head in 3000 and 5000 meters, but this eventually could lead all the way to the marathon, and wouldn’t that be a treat? Who would you choose? U’re Ethiopian famous so I’m admire u! b/c u are very examplary in sport world to us . Exciting stuff going on here!